As an instance of that, we present below 34 fragments from the classical book “The Imitation of Christ” . Commentaries are added which aim at decoding these passages, liberating them from the outer garb and revealing their inner ideas as part of the theosophical view of life. The first three parts of “The Imitation of the Christ” are mainly a treatise on Stoic philosophy under Christian garb: hence its importance in theosophy. The fourth part of the book does not quite belong to its contents. It may have been added to the book in order to avoid persecution from the Vatican. There are some “reading keys” to “Imitation”. Normally one must read the word “God” as meaning “universal Law”, but in some cases the term may refer to one’s own higher self, whose substance is universal. The term “cross” means “Karma”. The words “Christ” and “Jesus” are legendary symbols for one’s own sixth principle of consciousness, also known as higher self or spiritual soul. The 34 fragments are presented in italics, with bold type. At the end of each one, the number of page is given in parenthesis. The first sentence by Kempis means that one must go to the highest source possible. The Gospels constitute a true guiding light, if properly read. They contain a number of Pythagorean, Jewish, Confucian and Buddhist teachings and many tenets taken from other religions. However, the teachings of “Christ” are also beyond literature. They symbolically correspond to “the voice of the silence”, the wordless mantra of one’s own soul, in its universal, divine aspect. No dead letter reading can be efficient in philosophy or religion. The real meaning is hidden from the world of appearances. Therefore one’s study must combine several levels of consciousness. It is necessary to decode the wording, in order to see the teachings as a living, creative process. In order to truly understand theosophy one must test and apply its teachings in everyday life. Sacredness is potentially present in every situation. The lives of H.P. Blavatsky and other sages of all times constitute self-renewing sources of guidance and inspiration. “God” is the universal law; or, it is Nature, in its absolute totality and diversity. The Trinity symbolizes the mystery of inner unity and outward contrast and difference. No speech can be more valuable than the intention that moves it, or than the daily practice which constitutes its magnetic basis and foundation. Even if you knew the religious scriptures of all nations by heart, and the teachings of every philosopher, Eastern and Western, what good would that do you, if you lacked the perception of the unity of all beings and of your own duty towards the One Life of which you are part? All is vanity, except one thing, and that is fulfilling our duty to our higher selves and to the universal Law. To be mainly concerned about short term things, and to neglect the long term future that we ourselves are in part preparing during the present lifetime – that too is vanity. Our conscience is the wordless voice of our higher self or spiritual soul. “God’s grace” is a symbolic expression, meaning the subtle, impersonal energy of universal love. It corresponds to the sixth principle of human consciousness. It reveals the transcendent unity of all beings in spite of their apparent diversity. Such grace is everywhere: it belongs to no specific deity, much less a “personal” one. Our Creator is our higher self, who made us be born in the present incarnation. It can also be described as the Universal Law. A conscious “child of God” is he who lives in harmony with his spiritual soul. In theosophy, the astronomer and the humble peasant must be one and the same. There is no opposition between them. Real knowledge is inseparable from purity of heart. This is pure theosophy. Its technical correctness is precise. The “god” who will judge me is of course my own higher self. At the end of the present incarnation, it will revise every action of mine and establish the karmic lines of both my after-death states, and my next birth. The individual “Judgment” is made by our own higher self and the karmic Law at the end of each incarnation. Collective “judgments” are karmic points of no return in human and planetary evolution. They are examined in the book “The Secret Doctrine”, by Helena Blavatsky. What we do with our would-be knowledge, is the key question in authentic theosophy. Knowledge is only confirmed by the corresponding action, and this will be necessarily imperfect. Right action consists of sincere Attempts to do one’s best. These must be corrected and renewed over and over again, under each and every circumstance. Gradually one learns to learn from mistakes and to concentrate mind and heart on the freely chosen, noble goal. Our thoughts must be sincere and truthful. Whatever they say, those who do not even try to act with ethics, or have no respect for truth, are far away from the right path. Yet they deserve our impersonal respect and in the future they will have a chance to learn. We must aim at learning from those who are wiser than us, whether our contact with them is outward or inward, and takes place through written words or is wordless. In order to attain this goal, one must try to help the selfless work of the Souls who preserve universal wisdom and guide mankind’s evolution along the right path. Fight crime and selfishness. Fight even more their seeds and their sources. Don’t wash your hands before injustice of any kind. Take injustice to any being as an injustice to your own father, your mother, your spiritual teacher and yourself. Have mercy and compassion for selfish people, without joining or accepting their harmful actions. They are part of human family just as you are. We must follow the example of those stronger and wiser than us, and above all keep a constant eye to the ideal of human progression and perfection. If we seem to be stronger than anyone else, it is something totally unimportant; unless it is a sign of our own weakness and self-delusion. “The Day of Judgment” mentioned here is individual and takes place at the end of each incarnation. Acting in accordance with the Law of Equilibrium is better than merely knowing the rationale of esotericism. However, combining the two things is of decisive importance, as long as one has the eyes to see and can go beyond dead letter. The motto of the theosophical movement is “There is No Religion Higher than Truth”. While Truth transcends all its worded descriptions, partial approaches to it are useful if they point to that which is beyond words. The fulfilment of our duty is our best defence and asset in life. Attaining to a sane understanding of life depends on looking at it from a correct viewpoint, and only the practice of altruism can grant us that. Selfish minds distort everything they look at: true intelligence is both impartial and universal. The whole paragraph resonates with the writings of H. P. Blavatsky. The Word is the primordial “Sound”, the Mantram of Manifestation, the Music of the Spheres. Symbolic personalization of the universe and its laws must be accepted as cultural processes belonging to nations all over the world, and as forms to encode and record the ineffable Mystery. Esoteric tradition will teach how to “read” the legends related to Zeus and Saturn, to the Christian god, to the Hindu Brahman and Parabraham, to the Taoist Immortals, and so on. may my love for you last forever. only you can satisfy that desire. In blind belief, something is considered true because “god”, or the Christ, or someone else says so. In philosophy, it is the other way around. Something is not true because a sage says so, but the sage says that it is true because it is so. A true master never puts himself above law or truth. After attaining to truth, he becomes its disciple. This is the teaching of the original theosophy as taught by Helena Blavatsky and the Eastern Masters of the Wisdom. Our “Lord”, or “God”, is anonymous. It is our higher self. To it we owe loyalty. “The good person thinks carefully before following any inclinations of the heart. In that way, evil inclinations are put to the test of a well-formed judgment. “The hardest obstacle any of us has to overcome is our self. So your main effort should be to take charge of your inclinations. Your goal is to become each day a better master of your life. Church-centered Christianity offers no guidance to enlightenment. Dead letter approach to scriptures cannot be taken seriously, and this includes theosophical writings. The way to find Truth needs advanced research and studies, but this must be practiced on the solid foundation of a humbleness of heart and a calm observation of our own weaknesses. The whole purpose of life is learning. Yet every portion of knowledge we attain comes to us with its share of unavoidable ethical duties. One must examine what knowledge is actually used for. Because only an honest heart and an ability to aim at noble goals can allow us to use knowledge in correct ways and to deserve obtaining better information about life. Twenty-Four: What Have You Done? Mystical Christianity has always had a difficult relation with top-down Churches. It was not an isolated fact that Geert de Groote, the founder of the Brethren of the Common Life to which Thomas À Kempis belonged, warned and preached against clerical abuses. “Think of all those once-famous scholars and experts: even their immediate successors do not remember them. Their fame was not worth remembering. “God’s will” is the purpose of our own spiritual soul: “Christ” is a symbol for universal consciousness. Apart from the word “god”, the idea literally belongs to every profound philosophy around the world, including Buddhism, Pythagorism and Theosophy. “We need to be on guard especially against being quick to accept malicious gossip; for we are more likely to believe something evil than something good about another person. Human nature is weak and prone to evil, and talebearers are prone to exaggerate – so a prudent person avoids listening to idle reports about the faults of others. This is strictly theosophical, and H. P. Blavatsky wrote along these lines. “A brotherliness for one’s co-disciple, a readiness to give and receive advice and instruction, a loyal sense of duty to the Teacher…”. Indeed, mutual help is of the essence in the search for truth. “God’s truth” is the divine wisdom or “godly truth”. The idea of Sacred Scriptures includes classical books belonging to religions and philosophies of all time and every nation, from the “Huarochiri”, in the Andes, to the Central American “Popol Vuh” and “The Secret Doctrine”. One must read them from the point of view of one’s heart, and according to inner affinity. “You may find that your own curiosity gets in the way of your profiting from reading Scripture, because you find yourself stopping over various passages, seeking to know more and to enter into debate, when you should simply read farther. To profit from Scripture, you should read with humility, sincerity, and faith, and, of course, not so as to become regarded as an expert. Read the writings of wise men and women of all time. Listen to your co-disciples, for they are co-responsible for your spiritual welfare, and the responsibility is mutual. You can learn from their right actions and from their mistakes as well, just as they may learn from yours. “The person who desires anything (except God) too much is not at peace. The proud or envious person is never satisfied. Only those who live humbly and simply are entirely at peace in their souls. “Persons who have not mastered themselves soon ‘give in’ to themselves in small things. Those who are spiritually weak and who have not won control of the body’s appetites are not able to free themselves from slavery to earthly things. If they do succeed in denying themselves some earthly good, they are then unhappy and tend to react crossly to anyone who annoys them. Yet if they give in to their appetites, they find that their conscience will not let them be happy – and they are none the closer to the peace and contentment they are seeking. Each student must keep a constant eye to the ideal of human progression and perfection, and make practical experiments in detachment towards earthly things. It is necessary to avoid two extremes. One must not blindly obey to lower appetites; on the other hand, there is no use in following a sort of self-discipline that generates too much of a neurotic conflict. Balance is of the essence. The effort is long-term, and one must be one’s own master and disciple. There are also karmic tides to observe and to understand in this lifelong effort. Once one grasps universal truths, lower self desires are gradually uprooted. The daily discipline, the study and contemplation of universal law silently destroy the Roots of self-centeredness in one’s lower self. The foundations of a winning self-discipline are in realizing our personal interconnectedness to the whole Cosmos. When our mental horizon includes that of our galaxy, it becomes easier for us to have a humble and orderly life on the physical plane. There is an impersonal, divine dimension in human affections which we can learn to develop, and of which we may become fully conscious in due time. The sentence “if each of us does the good that it is in our power to perform…” expresses the main idea of Epictetus’ teachings. By fulfilling our inner spiritual duty, we learn to cooperate with our own higher selves, and with other, more advanced beings. “The Imitation of Christ”, by Thomas À Kempis, translated by P.G. Zomber, Dunstan Press, Maine, USA, copyright 1984, 250 pp. Number of the page of each quotation is mentioned in parenthesis at its end. 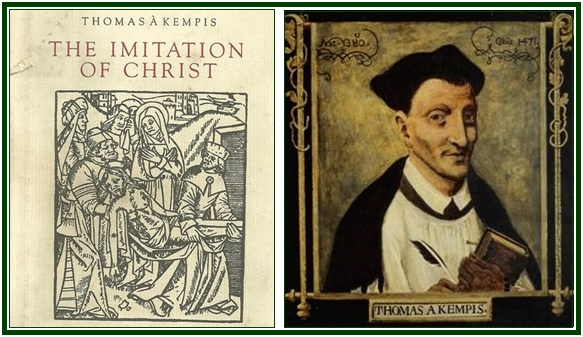 Another English language version is “Of the Imitation of Christ”, by Tomas à Kempis, Whitaker House, USA, 1981, 256 pp. See “Collected Writings”, H. P. Blavatsky, TPH, vol. XIV, pp. 377-378. For further independent evidence and research, examine the entries “Nicholas of Cusa” and “Brethren of the Common Life”, according to Note 2, above. “Five Messages”, H. P. Blavatsky, Theosophy Co., Los Angeles, 1922, Second message, p. 12. The pamphlet is available at our associated websites. Padre Antônio Vieira, “Sermões”, Editora das Américas, SP, volume IV, 1957, 441 pp., see for instance pp. 28-40. Such a contact usually includes the written words of classical teachings and a silent inspiration on the higher, wordless levels of perception. “A Concise Encyclopedia of Christianity”, Geoffrey Parrinder, entry “Brethren of the Common Life”, p. 48. See the article “Commentaries to the Golden Stairs”, by Carlos Cardoso Aveline, in our associated websites. “Letters from the Masters of the Wisdom”, edited by C. Jinarajadasa, TPH, India, 1973, First Series, p. 150, Second Letter to L. C. Holloway. “The Wisdom of Buddhism”, Edited by Christmas Humphreys, Curzon-Humanities, London, UK, 1987, 280 pp., p. 71. “The Principal Upanisads”, Edited with Notes by S. Radhakrishnan, London: George Allen & Unwin Ltd; New York: Humanities Press Inc., 1974, 958 pp., see p. 197. “The Mahatma Letters”, TUP, Pasadena, California, 1992, Letter XXIX, p. 223.